HE IS 3,000,000 LIGHT YEARS FROM HOME. The film's bittersweet themes include discovery, rescue, and escape, much like the Peter Pan myth (included in the film). 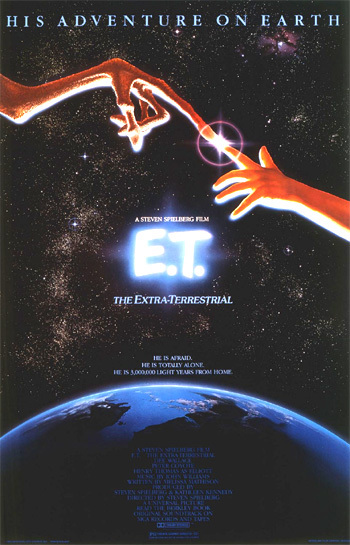 The John Alvin poster for the film with E.T. 's glowing, heavenly fingertip also presents a religious theme, recalling Michelangelo's 'Creation of Adam' painting on the ceiling of the Sistine Chapel. And the story of death and resurrection displayed parallels with the Biblical story. One of the film's earliest working titles was A Boy's Life. Much of the film was deliberately shot from a lower camera angle - from a child's point-of-view to manipulatively encourage younger viewers to identify with the characters, to simulate how overwhelming and threatening adults look to children (from the waist or knees down), and to force adult viewers to relive their own childhood. It was also shot in sequence, so that E.T. 's departure scene at its conclusion would contain genuine emotion. Spielberg was working simultaneously on these two suburban-based stories: E.T. (as director) and Poltergeist (1982) (as producer) - but while one was a fantasy story, the other was a nightmarish horror story. This story of a beloved alien creature was the flip-side opposite of a later Spielberg film, War of the Worlds (2005), with destructive alien invaders. Out of its nine Academy Awards nominations, it received four Oscars: Best Sound Effects Editing, Best Visual Effects, Best Score (John Williams), and Best Sound. The film lost in the categories of: Best Picture (it lost to Gandhi), Best Director, Best Cinematography, Best Film Editing, and Best Screenplay (Melissa Mathison, who was later married to star Harrison Ford - their scene in the film as the School Principal and Nurse was cut). This film, sometimes criticized as over-rated, was Spielberg's biggest blockbuster up to that time. It also popularized Reese's Pieces candy, Kuwahara bikes, and red hoodies. While the film was regarded by some as a religious allegory or parable, the film more clearly identifies with many childhood experiences: a troubled, broken family with a single parent and no positive role-models, a lonely, disenfranchised boy lacking emotional fulfillment, a boy's fierce caring for an equally-lost, stray creature or pet (also 'broken away' from his family), the need for friendship, the malevolent world of grown-ups and the perils of childhood, miraculous healing, wish-fulfillment, courage, transcendence, and homesickness. The tale is a variation of The Wizard of Oz (1939) for in this story, three young children assist a space creature to return to his home. It's also been considered a 'kids-version' of Spielberg's own Close Encounters of a Third Kind (1977), with an alien who is instantly established as a sympathetic creature. The film's award-winning musical score by John Williams (who wrote the scores for Spielberg's four previous films) enhanced the soaring, sentimental emotions of the film. After the credits (purple letters against a black background), the camera pans down from a starry night sky into the lush darkness of a forest near the flat brightness of a suburban community in northern California. An illuminated, round alien ship (glowing like a Christmas tree in the dark) and a crew of elf-like extraterrestrials are on a mission. An alien's hand with an elongated index finger and a shorter middle finger pulls some branches down. The interior of the space ship appears to be an immense greenhouse, with cone-shaped growths and other plants, and the sound of water dripping is heard. The aliens (botanists) appear to be exploring Earth's plant life and collecting samples. When a owl hoots, a red heartlight glows in the aliens' translucent chests, signifying that they sense danger. One of their crew members, a little, misshapen-headed alien creature collecting vegetation (a redwoods tree sprout or sapling) reaches his two fingers out toward the green plant. A rabbit watches intently as the plant is dug up, uprooted, and carried amidst the surrounding towering redwoods that reach into the sky. [This scene recalls the pastoral sights in Disney's Bambi (1942).] The small creature stops on the hillside and is curiously entranced by a wide expanse of city streets and yellowish lights far in the distance. Suddenly, he groans when a menacing pickup truck with blaring, blinding headlights shines its beam through the foggy air. The landing of the spaceship has been detected by government radar. Other large, noisy vehicles advance and circle around the creature, who has now become separated from the mother ship. Exhaust from a tailpipe emits foul smoke. From the point-of-view of the creature, men's legs walk by and step into a mud puddle. In the dark, government and scientific officials look at a map placed on a truck hood with their flashlights. One of the faceless agents is heard with jangling 'keys' - later his name is identified as Keys. [The agents are always portrayed by menacing, black silhouettes of advancing figures wearing heavy boots, with flashlights beaming]. When the crew of extraterrestrials realize that there are intruders around them, one of the aliens at the spaceship's gangplank hatchway sends out a communications-homing signal from his heart, signalling danger and alerting the others to immediately return to the ship. In dire fear, the lone alien pulsates its red heartlight from its chest to communicate with its own kind. The reverberating sounds of the alien creature and shaking bushes attract the attention of the men. The man with the keys (and the others) swing around and shine their flashlights toward the direction of the sounds, forcing the squealing alien to attempt to rush back toward the alien spacecraft with the men in quick pursuit. The hatch closes and the outer lights of the spaceship are dimmed in preparation for departure. The crew of aliens are forced to desert and abandon one of their members or risk being captured themselves. They quickly take off in their space vehicle to avoid detection, although their lights attract the attention of the eight men as they lift off. The extra-terrestrial moans - he has been abandoned, lost and stranded on an alien, hostile planet, Earth. The men try to locate the creature, but it appears that it has descended down the hillside's slope toward the suburban area below. Elliott: I'm ready to play now, you guys. One of the boys: We're in the middle, Elliott. You can't just join any universe in the middle. Michael suggests that Elliott ask permission of Steve, the Game's Dungeon Master who has "absolute power." To get rid of him for the time being, Elliott - feeling powerless - must first stand outside in the driveway of their suburban home and wait/pay for a pizza that one of the boys has ordered by phone. Elliott leaves the room with his baseball and glove and walks down the slick driveway in the rain and mist. As Elliott walks slowly back up the driveway to the house with the pizza, he hears sounds coming from near their home's backyard toolshed. He calls out his dog's name - "Harvey, is that you, boy?" Elliott's mother Mary (Dee Wallace-Stone), wearing an orange kimono, is working in the kitchen. When she bends down to place dishes in the dishwasher, one of Mike's friends extends his finger toward her rear - Mike yells for him to stop. Mom, mom, there's somethin' out there...It's in the toolshed. He threw out the ball at me...(To the other boys who are ignoring him) (Yelling) Quiet! (In a hushed voice) Nobody go out there. Members of his own family don't really believe him, but to play along, mock and ridicule him, the boys jump up from the table, grab kitchen knives and a flashlight and approach the outdoor toolshed with Elliott's Mom. One of the boys hums a few notes of eerie Twilight Zone music. Mary observes: "There's nothing in here." Although they find a few odd-shaped tracks in the dirt, Michael believes they are only the tracks of coyotes that have returned to the neighborhood ("the coyote's come back again, Mom"). As they return to the house and notice the squashed pizza, Elliott has to explain that it was an accident. Then, Elliott angers one of Mike's friends by reporting to his mother that one of the boys had disobediently ordered the pizza. Long alien fingers slowly wrap around the side of the shed door as the creature pants heavily. At 2 am in Elliott's bedroom, the family dog (sleeping on a lower bunk) awakens when it senses something stirring outside. On the upper bunk, Elliott hasn't even gone to sleep. With Harvey, he returns to the backyard with his flashlight. In the adjoining cornfield next to the house, Elliott sees the strange tracks again and moves some stalks aside. When he shines his light on the creature, they both shriek at each other on first viewing - both equally and identically scared. [This is the first of many instances when their characters merge and are linked - mentally.] The alien runs away through the cornfield as Elliott also screams and runs back to his backyard. Behind the house, the playground swings move back and forth and garbage pails fall over in the wake of the alien's flight. The next day while riding his bicycle into the woods high up above his house, Elliott scatters bits of Hershey's Reese's Pieces (like small, round, and colorful pills) on the forest ground, possibly to locate, feed and befriend the creature or to lead the hungry creature to his home with the sweet path of chocolates. [Although Spielberg wanted the bits of candy to be M & M's, the company - Mars, Inc. - refused, and lost out on the tremendous potential of product placement.] In the distance, Elliott notices a man [later identified as Keys] also looking for something in the same area of the woods. As Elliott rides back home, the alien's fingers move down the side of a tree - Elliott was being watched. Mom: It's not that we don't believe you, honey. Michael: Maybe a, a, you know how they say there are alligators in the sewers. Elliott: I couldn't have imagined it. Michael: Maybe it was a pervert, a deformed kid or something? Michael: Maybe an elf or a leprechaun? Elliott: Dad would believe me. Mom: Maybe you ought to call your father and tell him about it? Elliott: I can't. He's in Mexico with Sally. Michael (softly to Elliott): I'm gonna kill you. Mom: If you ever see it again, whatever it is, don't touch it. Just call me and we'll have somebody come and take it away. Elliott: They'll give it a lobotomy or do experiments on it or something. The children argue over who has to do the dishes. Their recently-separated mother (with her back to the table's conversation), still numb from the loss of the separation and abandonment, turns toward the table, emerges into the light with tears in her eyes and sighs: "He hates Mexico." She has been left with the tremendous responsibility of raising the children. Michael bangs his fist on the table at his younger brother: "Dammit, why don't you grow up - think how other people feel for a change." As Elliott rinses his dishes out under hot water at the sink, he looks through the rising steam, longingly gazing out through the window at the sky. Elliott is a young boy desperately in need of a friend. Again under a crescent moon, Elliott sleeps that night in a sleeping bag on a patio chair with his flashlight ready to catch a glimpse of the alien. Hearing scuffling noises in the direction of the shed, he is awakened and sees the short creature backlit from the light of the toolshed. Speechless and frozen in fear, Elliott with enormous eyes calls out in a stuttering whisper: "Mom, Mom, Mom, Michael, Michael, Mom." It is a terrifying, spellbinding moment for Elliott as the alien moves forward and then inches closer and closer to touch him with two elongated fingers. Rather than touching or harming him, the alien returns some Reese's Pieces on Elliott's blanket as an offering of friendship - or it's a request for more. After some tension and anxiety dissipate, Elliott wipes his nose, and the creature copies him. Noticing that he is being mimicked, Elliott gestures with other hand movements in an attempt to communicate. The wide-eyed alien imitates Elliott - the two characters are exact images of each other (not mirror images). The alien even mimics Elliott's yawn and tiredness by purring when the sleepy boy collapses in a chair in his room. Meanwhile, government officials [including Keys] scour the alien ship's landing area, discovering Reese's Pieces hidden there by the creature. Seen only at hip level, one of the men [Keys] reaches down and carefully picks up one of the strange colored "eggs" with his thumb and index finger and lifts it out of the frame to examine it. A crunching noise is heard on the soundtrack when the man eats the candy. Coke. You see, we drink it. It's a, it's a drink. You know, food. These are toys, these are little men. This is Greedo [from Lucas' Star Wars (1977)], and then this is Hammerhead, see this is Walrus Man, and this is Snaggle Tooth and this is Lando Calrissian [from The Empire Strikes Back (1980)] see, ...and look, they can even have wars. Look at this. Th-th-th-th-th-th. Uuuuuuuugh. (He play-acts with two characters who both shoot and kill each other.) Look fish. The fish eat the fish food, and the shark [a toy shark with moveable jaws on the end of a rod that he puts into the fish bowl] eats the fish, and nobody eats the shark. See, this is PEZ, candy. See you eat it. You put the candy in here and then when you lift up the head, the candy comes out and you can eat it. You want some? This is a peanut [a giant size replica of a peanut]. You eat it, but you can't eat this one, 'cause this is fake. This is money. You see. You put the money in the peanut. You see? It's a bank. See? And then, this is a car. This is what we get around in. You see? Car. (The alien takes the car - and like a typical child who sees a plaything - puts it in his mouth to eat it.) Hey, hey wait a second. No. You don't eat 'em. Are you hungry? I'm hungry. Stay. Stay. I'll be right here. OK? I'll be right here. Elliott deduces that the alien is still hungry - the first evidence that they have communicated and empathized with each other. (Their kinship strengthens as they build a variety of experiences together.) The family dog barks and threatens the little creature, scaring him as Elliott leaves the room. While Elliott is loading up on food from the refrigerator (Skippy peanut butter, cheese and tomatoes, a carton of milk), he is startled by the alien's scream. The alien is having trouble in Earth's modern-day world - he has inspected other objects in the room - a tennis racket and an easy-open umbrella. When it unexpectedly pops open, he screeches and scurries to hide. Elliott drops the milk carton on the kitchen floor and clutches his chest as they simultaneously experience surprise and fright. While carrying a plate of food back to the alien, Elliott finds the creature in his closet full of stuffed animals, terrified and shaking nervously: "Too much excitement, huh?" Michael: What have you got? Is it the coyote? Elliott: No. Look. OK. Now. Swear it. The most excellent promise you can make. Swear as my only brother on our lives. Michael: Don't get so heavy. I swear. Michael is ordered to stand in the middle of the room and close his eyes. When Elliott brings the alien out from his hiding place in the closet for an introduction, Michael turns around and is dumbfounded at the sight. At that instant, Gertie rushes into the room with a picture she has drawn for Elliott at school: "Elliott, look what I made for you." The impish blonde-haired girl is startled to see the strange-looking creature - her first view of it face-to-face. The creature cranes its neck up in fear (possibly having learned that this is an appropriate way to greet a stranger from his first meeting with Elliott.) She emits a loud-pitched scream - the alien reacts by belching out a horrifying moan in imitation. Elliott screams back at his sister to stop, as Mike backs up into a wall bookcase and knocks it down. Elliott grabs Gertie and covers her mouth as they hear their mother arrive home.